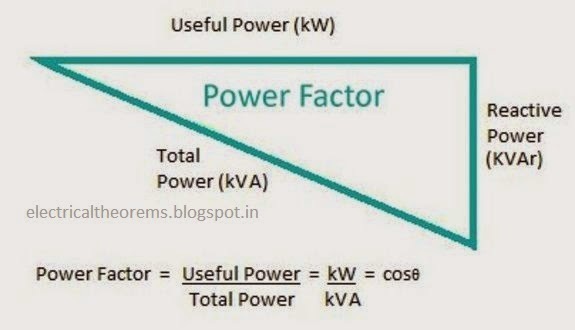 Power factor is simply a name given to the ratio of “actual” power (active power) being used in a circuit, expressed in watts or more commonly kilowatts (kW), to the power which is “apparently” being drawn from the mains, expressed in volt-ampere or more commonly kilo volt-ampere (kVA). All modern industries utilize electrical energy in some form or other. Two basic categories of load are encountered in alternate current (AC) networks. Devices containing only resistance e.g. incandescent lamps, heaters, soldering irons, ovens, etc. The current drawn from the supply is directly converted into heat or light. Since the voltage is assumed to be constant, the actual power (kW) being used is identical to the apparent power (kVA) being drawn from the line. The power factor is therefore unity or 1. In these purely resistive circuits, the current and voltage sinewave peaks occur simultaneously and are said to be “in phase”. used and the necessary magnetism is produced by electrical means. The electrical current needed for this purpose is not fully utilised. demand payment for this load according to specific tariffs. of current “power producing current” and “magnetising current”. former. Geometrical calculation of these two powers yield the apparent power. The ratio of the active and apparent power is denoted by cosϕ and indicates what fraction of apparent power flowing is actually used by the motor.The apparent power is greater than theactive power and hence the power factor is a value considerably lessthan unity. 1. Increased authorities cost since more current has to be transmitted, and this cost is directly billed to consumers on maximum demand kVA systems. 3. Reduces load handling capability of the plants electrical system.Most electrical supply authorities have changed to kVA demand systems from the inefficient kW demand system. Consumers are now billed and penalised for their inefficient systems according to the apparent power being used. In future, consumers will be penalised for plants with power factor below a pre-determined value. The term power factor comes into picture in AC circuits only. Mathematically it is cosine of the phase difference between source voltage and current. It refers to the fraction of total power (apparent power) which is utilized to do the useful work called active power. • Real power is given by P = VIcosφ. To transfer a given amount of power at certain voltage, the electrical current is inversely proportional to cosφ. Hence higher the pf lower will be the current flowing. A small current flow requires less cross sectional area of conductor and thus it saves conductor and money. © Electrical Theorems 2014. Watermark theme. Theme images by 5ugarless. Powered by Blogger.